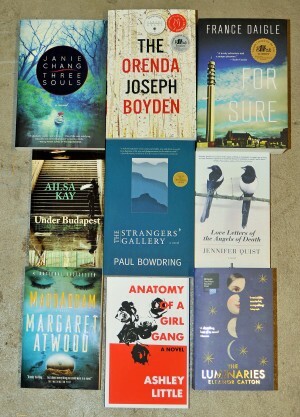 9 Canadian novels are among 142 titles that have been nominated by libraries worldwide for the €100,000 International IMPAC DUBLIN Literary Award, the world’s most valuable annual literary prize for a single work of fiction published in English. Nominations include 49 novels in translation with works by 37 American, 19 British, 9 Australian and 7 Italian authors. Organised by Dublin City Public Libraries, the 2015 Award was launched today, by the Lord Mayor of Dublin, Christy Burke, Patron of the Award, at a ceremony in The Dublin City Library & Archive. Libraries in Calgary, Edmonton, Halifax, Ottawa, St. John, St. John’s, Sydney, Toronto, Vancouver and Winnipeg were among the libraries in 39 countries worldwide who nominated books for the 2015 longlist. The Canadian titles include The Orenda by Joseph Boyden, MaddAddam by Margaret Atwood, and For Sure by France Daigle, translated by Robert Majzels. Two Canadian novels have won the Award to date, with Lebanese Canadian author Rawi Hage winning in 2008 for his novel De Niro’s Game, and the late Alistair MacLeod winning the prize in 2001 for No Great Mischief. Canadian author Kate Pullinger, winner of The Governor General’s Award for Fiction 2009 for The Mistress of Nothing, is among the judges of the 2015 award.